Your day-by-day itinerary now includes SEA LIFE Melbourne Aquarium as well as Queen Victoria Market. Start off your visit on the 5th (Wed): look for gifts at Yarra Valley Chocolaterie & Ice Creamery, tour the pleasant surroundings at Brighton Beach, and then take in the spiritual surroundings of St Paul's Cathedral. 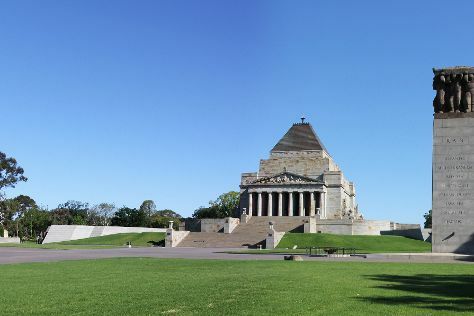 Get ready for a full day of sightseeing on the next day: browse the eclectic array of goods at Queen Victoria Market, get up close and personal with brilliant marine life at SEA LIFE Melbourne Aquarium, and then learn about all things military at Shrine of Remembrance. For photos, maps, traveler tips, and other tourist information, go to the Melbourne driving holiday planner. If you are flying in from Singapore, the closest major airport is Melbourne International Airport. Expect a daytime high around 16°C in June, and nighttime lows around 6°C. Wrap up your sightseeing on the 6th (Thu) to allow time to drive to Torquay. Your day-by-day itinerary now includes Torquay Farmers' Market as well as The Great Ocean Road. Step out of the city life by going to Lorne Beach and Jirrahlinga Koala & Wildlife Sanctuary. Step out of Torquay with an excursion to Erskine Falls in Lorne--about 1 hour away. To find traveler tips, maps, other places to visit, and more tourist information, go to the Torquay visit planning website . You can drive from Melbourne to Torquay in 1.5 hours. Alternatively, you can take a train; or take a bus. In June, plan for daily highs up to 16°C, and evening lows to 6°C. Wrap up your sightseeing by early afternoon on the 9th (Sun) to allow time for the car ride to Princetown. Your day-by-day itinerary now includes Twelve Apostles as well as Twelve Apostles Visitor Facility. Keep things going the next day: take in the dramatic scenery at Triplet Falls, then get answers to all your questions at Twelve Apostles Visitor Facility, and then explore the striking landscape at Twelve Apostles. To find ratings, more things to do, reviews, and tourist information, you can read our Princetown trip itinerary tool . You can drive from Torquay to Princetown in 2.5 hours. Alternatively, you can do a combination of train and taxi; or take a bus. On the 10th (Mon), you're off tohome. Head to Summerlands on Philip Island for the chance to see thousands of penguins waddling along the coastline. The Nobbies has been added to your itinerary. On the 15th (Sat), learn about winemaking at Rare Hare at Willow Creek Vineyard - Cellar Door and then stop by Mornington Peninsula Chocolates. On the 16th (Sun), you'll have a packed day of sightseeing: enjoy the sand and surf at Flynns Beach, then learn about wildlife with up-close encounters at The Nobbies Centre, and then head outdoors with The Nobbies. To see maps, reviews, photos, and more tourist information, read our Summerlands trip planning app . You can do a combination of car and ferry from Princetown to Summerlands in 5.5 hours. Other options are to do a combination of taxi, train, and car; or do a combination of bus, ferry, and car. In June, plan for daily highs up to 16°C, and evening lows to 7°C. On the 18th (Tue), you'll travel back home.